This is a unique picture book with a dual narrative designed to teach kids about light and dark, whilst engaging them in a story. Fox wakes up hungry and needs to leave her dark den to find food. She peeps outside but it is too bright to go out, so she waits until it is darker before venturing into the city to find food. Through her journey, fox navigates through moonlight, avoids the bright headlights of cars, explores fire and runs from the humans with their torches. 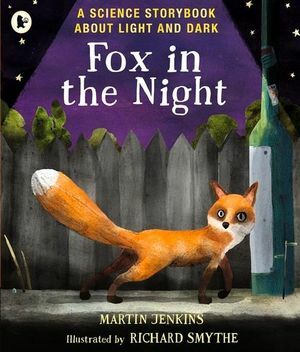 Each page contains the narrative of fox’s story, as well as some factual information, presented in a different font, to engage kids in thinking about the scientific elements of light and dark that are described in the story. The factual information explains how light comes from the sun, how shadows are made and that some light comes from electricity or heat. Smythe's illustrations are engaging and cleverly portray the various shades of light and dark in each scene as fox makes her way through the city and back to the safety of her den. Younger children will enjoy fox’s adventure, gaining subtle information about light and dark through the illustrative interpretation. Slightly older children will be interested in the additional layer offered through the factual text, prompting questions and discussion about different types of light and how it is made.